The first Italian F-35A Lightning II has rolled out of the Cameri Final Assembly and Check Out (FACO) facility on March 12. This first F-35A to be assembled outside of Lockheed Martin’s Fort Worth plant, the aircraft, designated as AL-1, will proceed to additional check-out activities before its anticipated first flight later this year. As well as building all Italian F-35A and F-35B aircraft, the facility is programmed to build aircraft for the Royal Netherlands Air Force, and has the capacity to deliver to other European customers in the future. 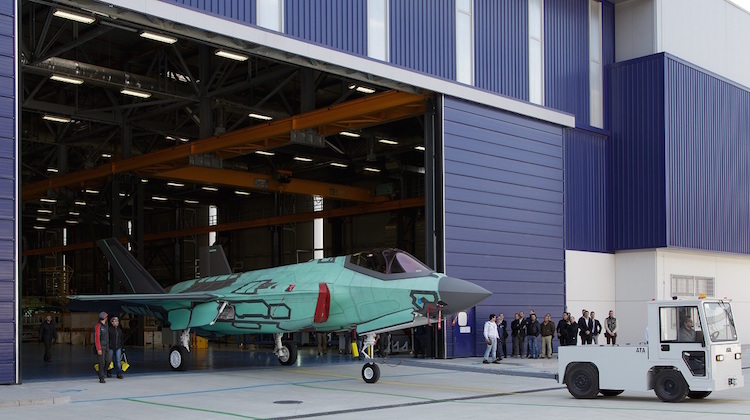 In December 2014 the Cameri FACO facility was selected as the F-35 heavy airframe maintenance, repair, overhaul and upgrade facility for the European region. The negotiating position of Level 2 partner Italy is in marked contrast to Level 3 partner Australia in relation to assembly of the F35. Italy’s confirmed order is only 6 F35A, but 30 F35B and up to another 63 F35A are likely. Italy will also assemble the other Level 2 partner the Netherlands 37 likely F35As. Our Australia USA FTA and the mooted TPP if signed did not result in the assembly of any of the 72 F35s approved to date. We are still committed too up to 28 more F35s. Assembly for Singapore and or South Korea who we also have an FTA with could have matched Italy’s total. Japan who is not even a partner has ordered 5 F35s from the USA line but another 30+ assembled in Japan are the likely next step given they secured the N Asia maintenance contract. Japan built under licence over 100 LM P3s, a similar amount of Sikorsky Sea Hawks and 223 MD F15J/DJ Eagles. Why were we so short sighted given that the order matches the 57 FA18A and 16 FA18B assembled for the RAAF? The other 2 FA18B were assembled in the USA. Screwed by the Deputy Sheriff approach again. australia has no manufacturing future …its bipartisan policy …. labour just thinks are future is to just dig rocks out of the ground & sell it to china ..(& tax the profits away from business) & the LNP don’t consider us a competitive option … in the global market … were to small and pay to hire wages .. Does it sound like a Maserati? Chris, I’ve wondered the same, except I’d find it hard to imagine Singapore or South Korea wanting (or paying extra for) Australian-assembled F-35’s. I think it basically comes down to cost; I understand there would have been a very significant price premium to establish a separate Australian assembly line / FACO. Furthermore, there is / has been enough controversy over RAAF acquisition of the F-35 without adding to it with a few extra billion dollars in costs! I’m happy we will end up with 72 ~ 100 of the 5th generation jets, even though local assembly aka the F/A-18 would have been nice.